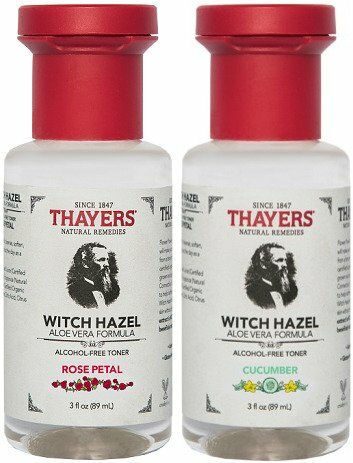 3 oz Thayers Rose Petal & Cucumber Alcohol-Free Witch Hazel with Aloe Vera Formula Toner will make your skin bloom. Rose & Cucumber combo Thayer's remarkably soothing Toner is made with rose-petal water, Cucumber peels, Vitamin E and our proprietary Witch Hazel extract. Ingredients: Purified Water, Aloe Barbadensis Leaf Juice (Certified Organic Filet Of Aloe Vera), Glycerin (Vegetable), Fragrance (Natural Rose), Hamamelis Virginiana Extract (made from Certified Organic Witch Hazel), Rosa Centifolia (Rose) Flower Water, Citric Acid, Citrus Grandis (Grapefruit) Seed Extract. Bullets change to: Alcohol free, paraben-free, naturally preserved, hypoallergenic. Made with organic witch hazel and aloe vera. Natural rose fragrance. Cleanses, soothes and tones skin. 3-oz. Bottle Combo.